An activist is due to appear in court on Tuesday 24 November for an action at Lockheed Martin’s London offices during the DSEI arms fair. Lockheed Martin produces cluster bombs; designs nuclear weapons, and makes the F-35 Lightning (overpriced,under-performing combat aircraft). In the US and elsewhere Lockheed Martin is virtually running it’s own foreign policy doing everything from hiring interrogators for US overseas prisons (including Guantanamo bay) to managing a private intelligence network in Pakistan. On Tuesday 8 September, the offices were marked with blood-coloured dye which ran down its walls. The pavement was decorated with the with outlines of bodies and words pointing to the building as well as banners, one saying, ‘Lockheed Martin: merchants of mega death’. 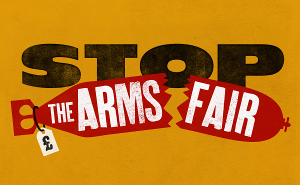 Stop the Arms Fair urgently to stop the financial deficit!